Sketch Engine supports many more languages via the web interface. See the list. A Word Sketch for the highlighted word displays suggestions of the most typical word combinations as used by native speakers. Examples in context can be displayed with a click of the mouse. The thesurus generates a list of alternatives for the selected word. The list contains synonyms, antonyms, similar words and words form the same topic area. The concordance looks up examples of the word or phrase in a parallel text corpus and displays the matching translation. For languages without a parallel corpus, a monolingual concordance is displayed. Our next generation term extraction delivers exceptionally clean results, no manual cleaning required. It is already available through the web interface and will be added to the plugin soon. 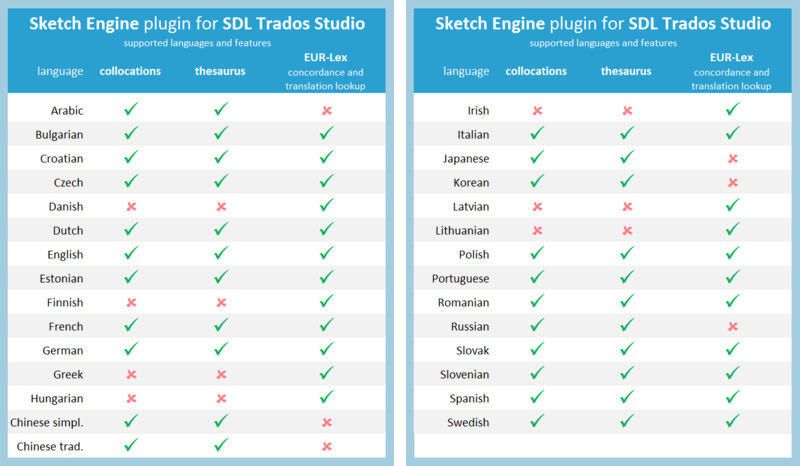 To download and install the Sketch Engine SDL Trados Studio plugin, visit the SDL AppStore. After installation, close SDL Trados Studio and open it again. The plugin is free of charge but a Sketch Engine 30-day free trial or a commercial paid subscription is required. If you do not have a Sketch Engine subscription, register or the 30-day trial or a paid subscription to get your API key. Your plugin is ready to communicate with Sketch Engine now. Highlight a word in your source or target text, right-click and select concordance, collocations or thesaurus. Our support team can be contacted via this form. 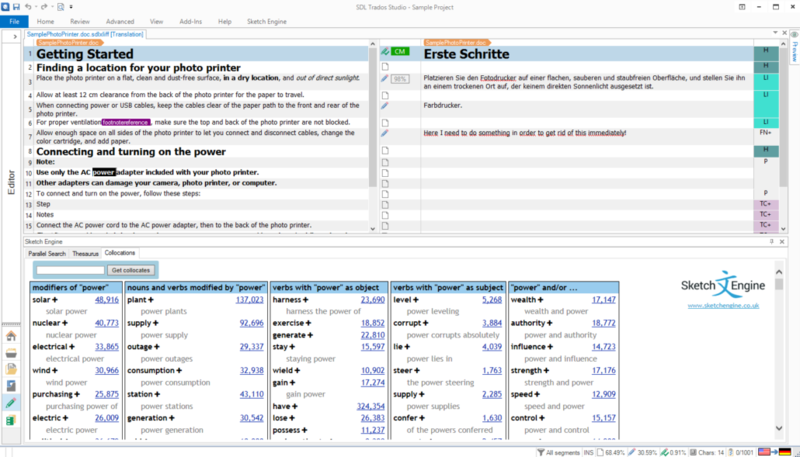 Unfortunately, it is a feature of the SDL Trados Studio that after right-clicking words underlined by the spell check, the the spell check menu is displayed and not the plugin menu. The Sketch Engine plugin menu will not be displayed for such words.